Hatch Chile Cheese Bread is light and fluffy, airy with a nice crispy crust thanks to the addition of amber ale. The smoked cheddar is just the right compliment to the spicy Hatch chiles. It slices thin when cool and makes awesome sandwiches. Ha! When you put the wrong title on the image…. way to go, Marye. Once September hits you see pumpkin spice everything all over the Internet but not me… this time of year means one thing to me — Hatch chiles! I don’t know what they’re like. Just trust me. They are awesomeness. Hatch chiles always make me want to curl up on the window seat with a quilt (and really, how crazy is that? It’s 90F today) and read travel articles about Santa Fe. Someday Santa Fe, someday…. It just seems like a romantic spot to me. I imagine staying in a B&B, exploring cool, artsy shops as it gently begins to snow. Heading back to the B&B to cuddle in front of a roaring fire… Somehow they embody the flavor of that fantasy. Y’all do understand that I am a writer, right? And everything that I don’t experience in my life I imagine I’m experiencing… I identified with Anne Shirley (Green Gables) way too much as a kid…. No real secret to making this. Use a flavorful beer or ale or you might as well just use water. Go for something dark but not necessarily expensive. I like a smoky cheddar in this but feel free to use any kind of cheddar you like. I use gluten flour a lot in my bread recipes and I have had people ask me if you can leave it out. Yes you can but you have to understand that it REALLY changes the texture. This bread has a lot of heavy ingredients in it to hold up. If you don’t use gluten it will not be light and fluffy, it will be dense and not rise as well. As long as you understand that you’re good. I’ve also added potato flakes to help make the bread crumb tender and light. When I work out a bread recipe it’s based on how I know the ingredients are going to work together. You are welcome to change, omit, and substitute however you like — but I can’t guarantee the results. This makes amazing toast and perfect sandwiches. Just a little spicy – not too much. The crust is crispy and fantastic but if you like a soft crust remember to cover the Hatch Chile Cheese Bread loaves while they are cooling. Is it just me? Is there a food that reminds you of a place that you’d love to visit? The following is an affiliate link. If you click through and buy I get a small commission which is used to keep the blog up and running smoothly. Thank you for your support! If you’d like to hone your bread skills, whether you are just beginning or a seasoned baker, you are going to love my book. It takes you through the process step by step to ensure success every single time. Add the yeast, sugar, and beer to the bowl of your mixer. Let the mixture sit for about 5 minutes, it should bubble up. At the water, gluten flour , and potato flakes with the mixer on low. With the mixer running add the chiles, salt, and cheese. Add the bread flour, 1 cup at a time, until the mixture forms a ball. Knead for 4 to 5 minutes by mixer or until the dough is springy and elastic. Form the dough into a ball, rub with olive oil, and place in a large, oiled bowl. Let rise for 1 hour or until doubled. Bake at 350F for 30 to 40 minutes, or until the bottoms sound hollow when tapped. Just mixed up this recipe and noticed you don’t have when to add the salt in the instructions. I forgot about it and noticed after I got it set to rise. Hopefully it turns out okay. This recipe looks yummy otherwise though, my husband and I love hatch peppers! 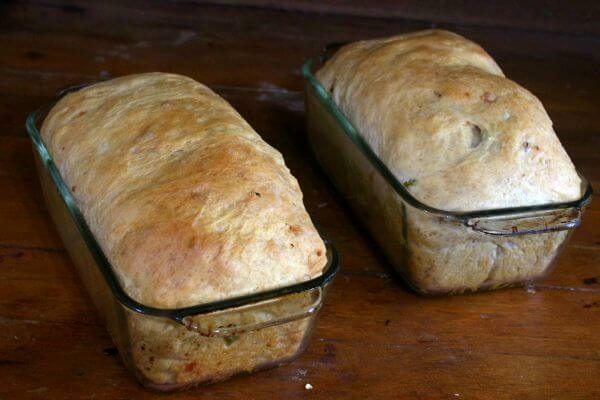 I love hatch chiles…and I’m always in awe of your gorgeous breads Marye! Nothing like homemade bread! And the flavors here…yum! this would be perfect with the chili in my crockpot!! That looks wonderful–so much flavor! I can think of a lot of Southwestern soups it would go perfectly with! 🙂 I know! I love this stuff! 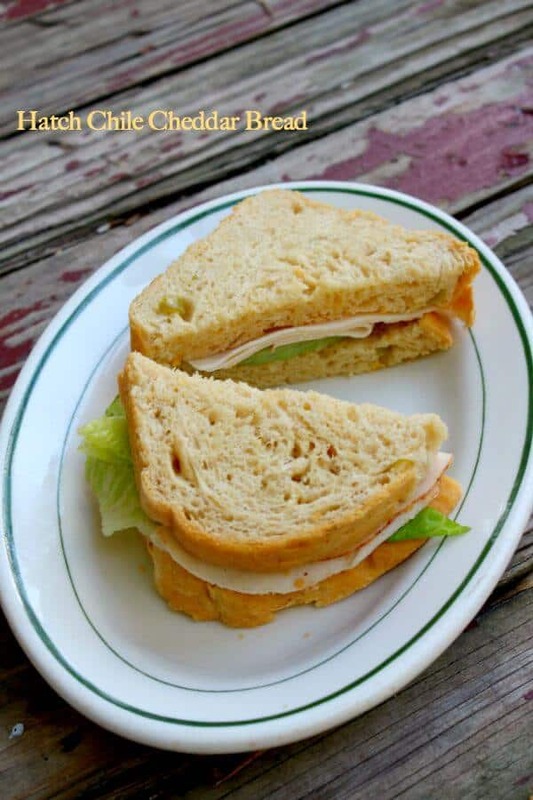 Marye, this is a wonderful way to spice up ordinary bread! It would be a fab accompaniment to chili or stew, too. Yum! 🙂 It makes really good sandwiches! 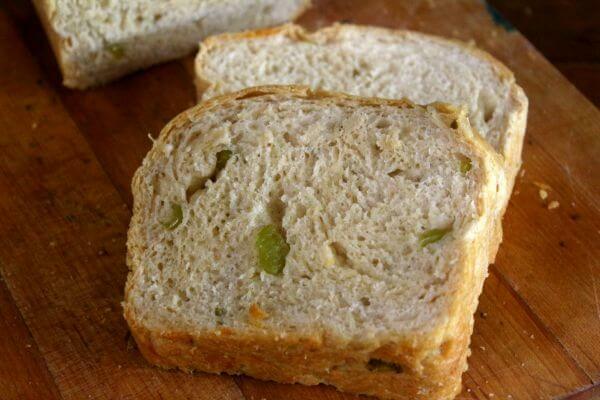 I love the spicy kick to this delicious and very wholesome bread! Looks perfect! This is so good, Heather.